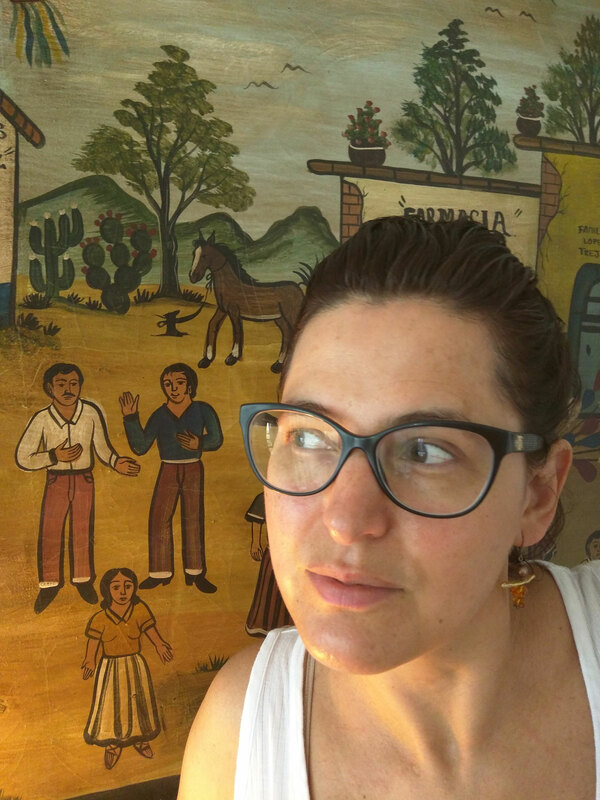 Editor’s note: El Tecolote is proud to announce a new collaboration with literary artist, community activist and Mission resident Adriana Camarena tilted “Unsettled/Inquietos,” the pilot for which we present here to you. For her opening essay, she profiles a longtime Mission resident known as Indio, weaving his story together with an exploration of the area’s ancient natural waterway system to create a unique account of the neighborhood’s indigenous history. Camarena conducted her historical research using Internet Archive and FoundSF’s archive of Shaping San Francisco, as well as historical newspapers at the San Francisco Public Library, historical Spanish land grants and diaries, and literature and oral histories of the Ohlone people. His street name, “Indio,” means Indian in Spanish. “You are Native-American?” I asked. In response, Indio raised his sleeve to show a tattoo of a spirit stick with two long eagle feathers. “I was part of the Alcatraz Occupation,” he said, and as he did, his eyes welled up with tears. I asked Indio, “Can I come back, and get to know you?” explaining that I would be away for travel, but would find him when I returned. Long before the Mission existed, there was an indigenous village close to a creek called Chutchui. A group of Yelamu people, who spoke Ramaytush, lived at Chutchui. In April 1776, the de Anza expedition arrived in the vicinity of their village, scouting for good land. “We arrived at a beautiful creek,” wrote Father Pedro Font in his diary, “which because it was Friday of Sorrows, we called the Creek of Sorrows (Arroyo de los Dolores. )” The creek was lined by fragrant yellow chamomile, violets and herbs, and ambled down what is today 14th Street, into a tidal lagoon which the Spaniards named the Lagoon of Sorrows. The village of Chutchui would lose its name, as the Yelamu people lost their original names through baptism into the Mission ranch system. Twenty-year-old Chamis, the first Yelamu to be baptized, became Francisco Moraga, adopting the name of the patron saint of the Mission and the last name of his godfather Lieutenant José Joaquin Moraga, a Spanish invader. 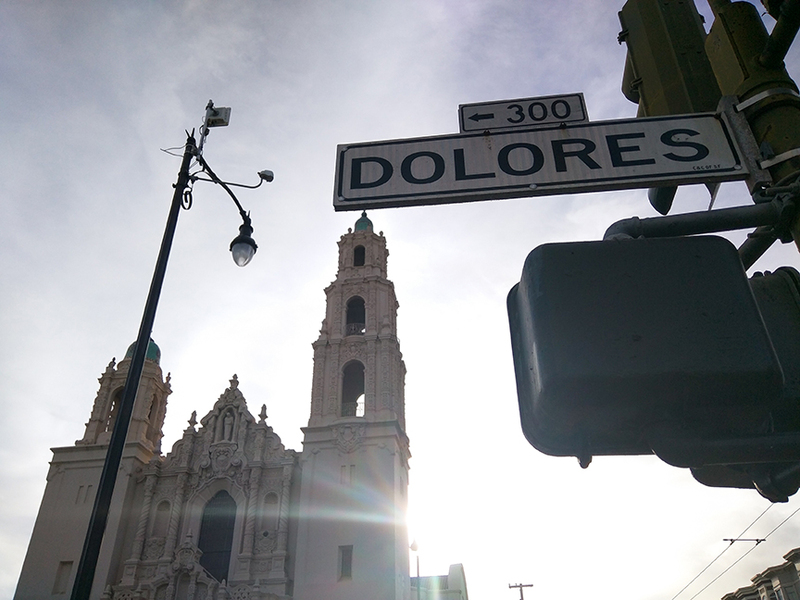 In the following month, after meeting Indio, I looked around Dolores Park, then again “downstream” on 16th Street, but I could not find him anywhere in the Mission. One Monday in October, I spent the morning hours searching for Indio. I approached an older gentlemen on Capp Street near 16th Street, who was sitting on the sidewalk near some black trash cans. I asked the man (who I’ll call P.) if he knew Indio. I described him; his tattoo. Another man, W., arrives. He has the ice. P. gets out a pipe. W. looks at me with concern, and P. says, “She’s alright.” A man comes over and looks at me and says, “She’s pretty.” P. says, “She’s not about that.” And lights the pipe. They offer it to me and I shake my head, and watch as each of them smokes the pipe. The Ohlone dancers cloaked in bearskins prepared to enter the circle through the sacred doorway. The soundwaves from drumming coursed through my body, entrancing me. I deeply wanted to weep, as I watched, not men but bears, start dancing around the fire, their embodiment of these animals in movement precise. I was further undone when I was invited—taken in—by the Ohlone to walk among the bears inside the circle for a healing. The same day of 1776, on which the Spaniards found the location for the Mission, they went exploring down a canyon where they met a fearsome bear, who was not afraid of them. The soldiers unloaded their firearms, and killed it. The Giants won the World Series for the third time in late October 2014, beating the Kansas City Royals, and I went out to the streets to celebrate and document the chaotic joy of the neighborhood. A few hours later, I headed back home on the emptying Mission Street. Riot cops were choking the intersections at 16th Street and 24th Street, leaving us stragglers in the middle lands with the walk of the place, howling “hooray” in diminishing numbers. Near 20th Street, I spotted the contagious joy of a homeless man dressed in his Giants gear pushing his cart downhill, picking up bottles, whooping in victory, pumping his fist in the air, and slapping hands with drunk hipsters and OG’s crossing his path. I ran over for a victorious high five, only to find myself yelling, “Wait?! You’re Indio!” We hugged, and then the current of celebration carried us south and north, in opposite directions. 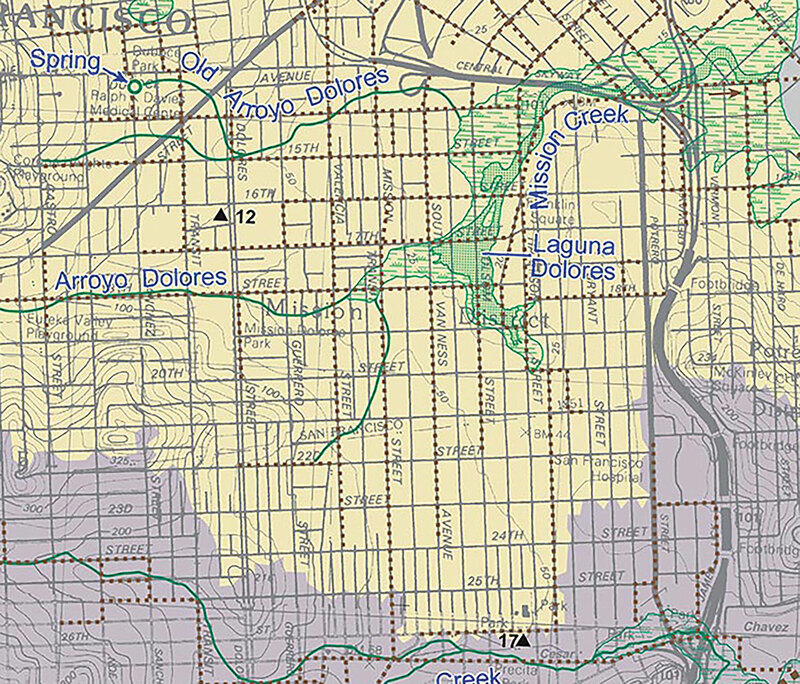 A creek once marked the southern boundary of the Mission valley. The creek named Precita (Little Dam) by Spanish ranchers was sourced from the slopes of Twin Peaks. The waterway skipped steeply down 24th Street, dropping south towards the foot of Bernal Hill where it gathered further run off. The street lining the river would become known as Army Street, and by 1899, the residents near Army Street would be pleading with the City for a sewage system to contain the flooding and stench caused by Precita swamp. Only a few years earlier, a weekend storm had met up with what an 1894 issue of the San Francisco Chronicle called the highest tide known in years, perhaps a King Tide, and flooded gardens and basements, cottages, a hay barn and horse stables, a grocery store whose stock floated downstream, and a shoe factory whose entire leather stock was ruined. The flooding reached up to San José Avenue, while a veritable lake formed on Mission Street. Considering the extent of the damage it caused, the creek must have originally been a hearty one, at times a river with a pull where it met the active tidal inlet near the foot of Potrero and Bernal hills. It was finally here in the Indian Summer of 2017, where I located Indio again. This is his story. When Alcatraz prison shut down in 1963, the Bay Area Chapter of the American Indian Council sought to place a claim on the island. But it was not until the Indian American Center in San Francisco burned down in October of 1969, that local Native Americans were spurred into action to take over Alcatraz. Organizers finally succeeded in their goal with a predawn invasion of the island on Nov. 20, 1969, in which 89 Indian men, women and children reached the Rock and reclaimed it as an occupation of Indians of All Tribes. Being so young, Clyde spent his days exploring the island, even entering places where he should not be. “It’s spooky at night too. The place is squeaky.” He remembered reveling in those moments when supporters on boats from San Francisco would break through the FBI blockade to throw food to the occupiers. The Indians of All Tribes were completely dependent on the delivery of supplies. The symbolic action and charismatic leadership of the movement succeeded in drawing nationwide attention to Native American struggles, but in the months to come, the leadership of the council would change and wane as people came and went. Then in January 1970, the young stepdaughter of Richard Oakes, one of main movement leaders, fell to her death from one of the prison’s stairwells. Broken hearted, he and his partner left the island. The occupation spiraled into problems as the political core of the movement diffused, and on June 11, 1971, nineteen months and nine days since the occupation had begun, federal authorities escorted out the final 15 Indians from Alcatraz. His social center became the American Indian Center that was reestablished in San Francisco at 225 Valencia Street, near 14th Street, across from the old Levis Factory that is now a school. “I hung out there practically every day, playing pool and going to the monthly powwows.” When the previous center had burned in 1969, it had 2,000 dues-paying members in the Bay Area, and served an estimated 30,000 in the broader Indian community. Indio describes Valencia Street as being thick with Indians from Montana, South Dakota, Florida, all tribes. “I used to see Indians all the time back then.” He might still bump into one on occasion around Capp and 16th Streets. Over time, as the rent increased, Native Americans moved out to Oakland and beyond. At the age of 14, Indio fathered a child with a strawberry blonde, blue-eyed Irish girl from the Mission, same age as him, called Michelle. “It was the happiest moment when the baby’s head full of hair comes out. And she’s not white, she’s dark just like me. …I was holding Michelle’s hand and she was screaming how much she hated me. Then, we both started crying…. We went to lamaze classes together, I think we were the youngest couple in the room.” They named their daughter Sasha. I ask Indio, whether Michelle’s parents were cool with him. “Oh yeah, they were an Irish biker family. Her dad owned an auto body shop on 16th and Capp Street. Her mom was 6’1 with tattooed arms.” It was Indio’s mom who wasn’t happy that he was not with his race. His mom went on to marry Charles Leading Fighter, who fathered Indio’s two brothers and sisters. Indio went on to have another dark-skinned, dark-haired daughter with Michelle, who they named Kayla. But their marriage didn’t last, they were too young and Indio started going out. One day, Michelle greeted him at the door fed up, handed the two babies to him, and walked off for a break. Indio still cares very much for her, and wonders sometimes what would have become of him, if they could have stuck it out. Michelle went north close to Chico, and Indio lost communication, although he never failed to send child support. It was during this time that Sasha and Kayla, hearing that their father worked as a florist in San Francisco picked up the Yellow Pages and called every flower shop in town until they found him. The next weekend he was up there visiting them. A few years back, they asked Indio to enroll them as part of the Sioux tribe under his registration number in North Dakota, “They don’t say they are white. They say they are Indian….” Sasha and Kayla have children of their own now, five little Sioux granddaughters to Indio between the two of them. Indio has been back to North Dakota two or three times when he was bored, and lived off and on in Concord and Vallejo, but mostly the Mission was home. He has lived in apartments everywhere in the Mission: 16th and Valencia, 18th and Capp, 18th and Linda, 24th and San Bruno. In 2004, he became very ill after he collapsed on the job. A benign tumor had developed in his spine, which cut off circulation to his legs and hip. He required a hip replacement. Holding on to employment and housing became more difficult after his injury. Around 2009, Indio started eating and volunteering at St. Martin de Porres kitchen on Potrero Street between 15th and 16th streets. Soon enough, he was coordinating volunteers, and soon after that living in the communal household attached to St. Martin’s. For five straight years, he was up at 6 a.m. and closing down at 6 p.m. “Why did you leave?,” I ask. “I burned out. I just burned out. I was working all the time.” After that he was homeless again. For a time, Indio lived out on the street near the corner of Folsom and 19th, where a red-tailed hawk adopted him. The hawk had started perching on a lamppost above him. One morning the hawk brought a bird and dropped it next to Indio. Without hesitating, Indio hid the bird under a blanket. The hawk flew away and brought another bird and ate this one. After that day, every morning the hawk brought Indio a bird to eat, and then went to fetch one for himself. “I think he thought I was his baby hawk,” he laughs. Indio used to recycle for income, but he cannot do that anymore. His hip and leg have acted up again, and walking is difficult. Biking is better. 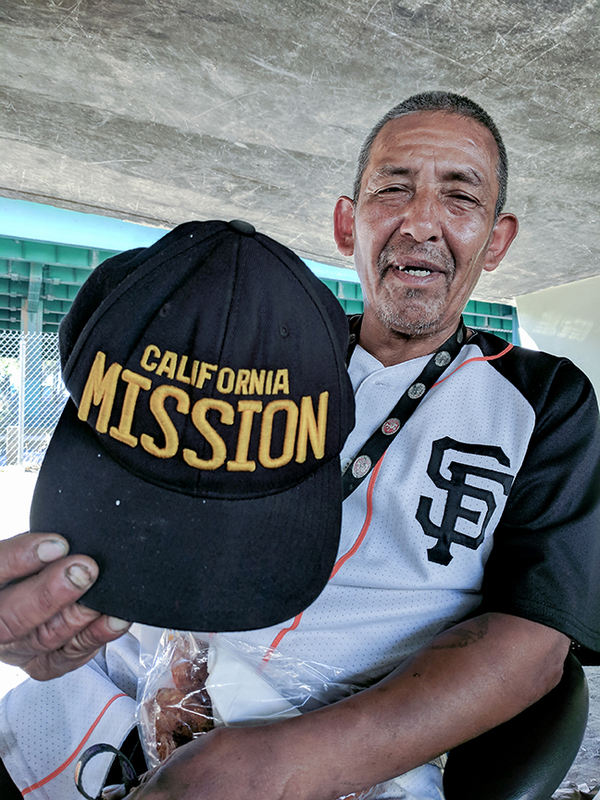 He lives on disability income and hopes to be able to go into the new Navigation Center on South Van Ness soon; more for Melody’s sake than his own, since she will be able to access additional services there that she wants for her own disabilities. Living under the U.S. 101 ramp at Cesar Chavez Street is stressful. The highway patrol comes around every Monday and Thursday demanding that everyone vacate the premises . 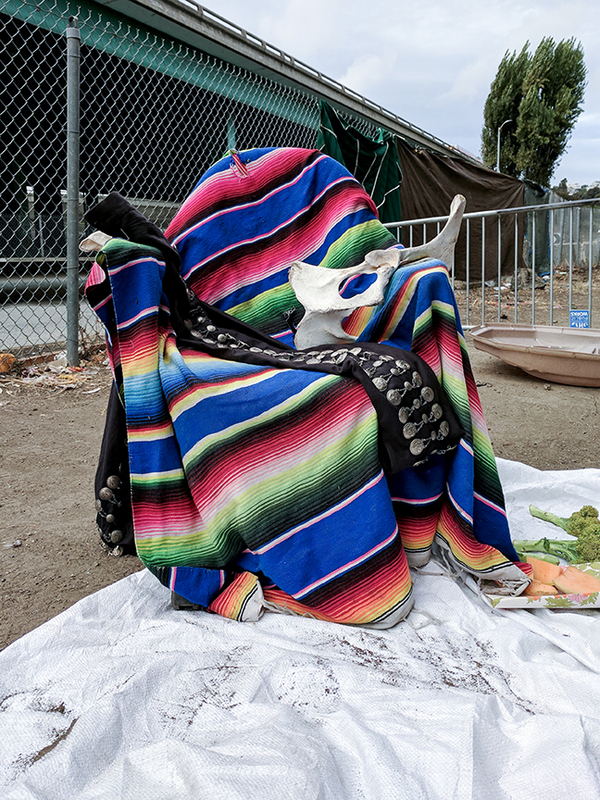 “They come in saying, ‘You got 10 minutes to move or we’re putting you in cuffs.’” Those days Indio and the Melodies are up at the crack of dawn shuffling out their belongings onto the City bike path immediately adjacent to the ramp. The underpass community moves their neat little line of mobile carts right back in the next day. It is safer to live in an enclosed area with a dirt floor but a solid roof (in this case a ramp) over their heads. In 1969, the Indians of All Tribes published “The Alcatraz Proclamation to the great White Father and his People,” in which they offered to buy back the island from the federal government for “twenty-four dollars in glass beads and red cloth.” They made the case that the island fit the definition of an Indian reservation by Caucasian standards given its isolation, lack of modern facilities and transportation, lack of fresh running water, no industry, employment, education or healthcare services, and other dire characteristics. 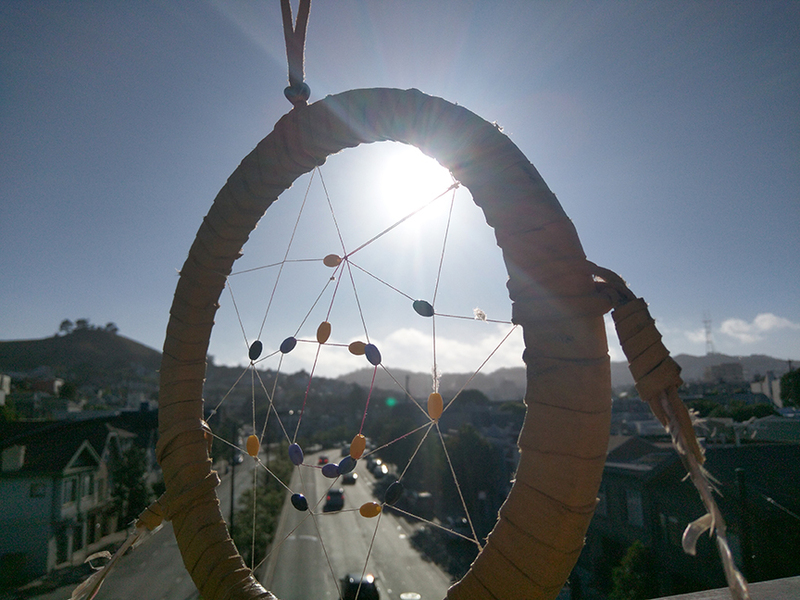 Despite the geographical challenges, the council proposed to develop appropriate and visionary institutions for Native American studies, spirituality, ecology, and training in traditional arts and crafts. Like Alcatraz, The Hairball is similarly desolate land. But it too could be envisioned as a refuge for the poor guided by Native American perspectives. 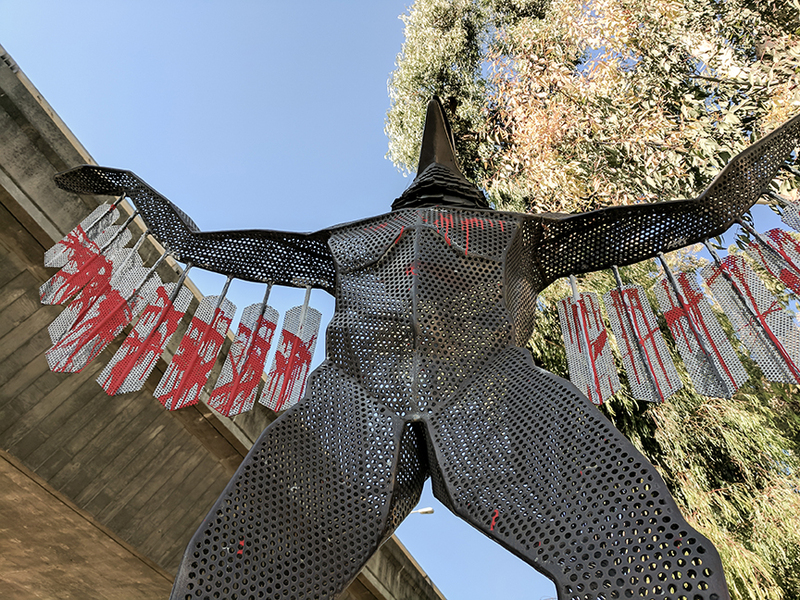 Consider that the U.S. 101 underpass occupation already has one benefit over the island: At night, Indio can hear the running water of old Precita Creek coursing underneath him, still resisting extermination. Please join the author for a public reading on October 7th, 2017 at 8pm at Mission Cultural Center for Latino Arts, located at 2868 Mission Street, San Francisco, as part of MAPP. The next issue of “Unsettled in the Mission” will be published in the November 2nd, 2017 issue of El Tecolote.